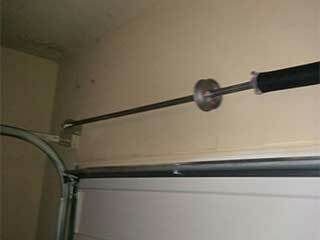 There are some parts of your automatic garage door system that you may be able to handle by yourself. However, when it comes to the springs, you'd be more than wise to let someone like our professional team handle them. The results of any DIY attempt can be catastrophic. These are the two different types that can be commonly found in modern garage door systems. Extension springs come in pairs, one for each side of the door. They work by extending when the door is closed and then using the tension created though this action to pull the door back up when it comes time to open it. Torsion springs operate differently, but they serve a similar purpose. Only one of them is usually required (unless the door in question is extremely heavy). They are installed horizontally above the door, across a steel rod which twists and unwinds them, effectively using torque in order to pull the door up. Although torsion springs are considered to be "safer" than their extension counterparts, they are still tightly wound with tension and must only be handled by an expert. The serious injuries that can be caused by a broken spring that goes flying aren't worth the risk of trying to perform any adjustment or replacement task by yourself. When in doubt, let our experts figure it out. Not only can our technicians at Garage Door Repair Conroe handle any type of problem you may be experiencing, we can also offer you a regular maintenance service that will help your system last for a lot longer time. Spring lubrication is a key focus of this service, and we will make sure these dangerous yet crucial components are able to continue functioning optimally for as long as possible. If we find that their condition is getting too worse for wear, we'll replace them on the spot. Call us today. How Long Can Garage Doors Really Last? Your automatic garage door is a complex system that needs a professional to repair it when something goes wrong. Our company does more than that, though. Our professional technicians have a lot of experience in this field and we can offer you a lot of different services. Check out our website to learn more. Thank you for choosing our company! Feel free to browse our website for more information in the meantime. Our team at Garage Door Repair Conroe is at your service any time!